The iPhone 4 camp is divided into two – one that bats for AT&T, while the other are clearly comfortable being part of the CDMA iPhone group from Verizon Wireless. That might mean there are even more iPhone 4 owners in the US than originally thought, but it poses a connundrum for accessories manufacturers, as they will now have to release two versions for the iPhone 4 for most of the time (due to the slight hardware difference). Well, mophie has had plenty of experience with iPhone accessories over the years, and their latest foray would be the juice pack plus that will be compatible with both the CDMA and GSM versions of the iPhone 4. The juice pack plus is actually an enhanced capacity rechargeable external battery case that will offer more than double the running time, making it an essential accessory for any iPhone user who currently already needs to juice up their handset at least once in the day. 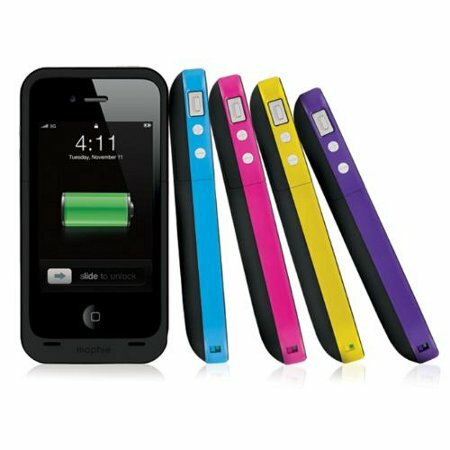 Not only that, mophie has also rolled out a special edition purple juice pack plus case to commemorate the situation. The mophie juice pack plus is capable of offering up to 2,000 mAh battery capacity, and that makes it the largest of any external battery case that is produced by mophie to date. Apart from that, the case itself sports an ultra-thin and light-weight design, with a dual injected rubber grip for extra grip – perfect for those who tend to have sweaty palms. Despite all the extra,s the mophie juice pack plus is a mere millimeter thicker than mophie’s flagship case, the juice pack air. The special edition purple juice pack plus will actually see a limited production run of just 3,000, where you get a purple band right around the edge of the case. For those who want more colors in their case, additional ones will include black-on-black, and black with cyan, magenta or yellow banding. TO put things in perspective, how much more punch does a 2,000 mAh battery capacity pack? How about the equivalent of 8 more hours of talk time on 3G, or 7 more hours of Internet surfing? Your ears will also appreciate 44 hours of additional audio playback, and 11 hours of video playback. Wet Smartphone Emergency Kit – CPR for your iPhone?